Fruma Kidron’s papercuts are inspired by her deep love of her homeland Israel, its nature and plant life and a deep commitment and attachment to Jewish folklore and culture. Her work uniquely combines pomegranates, grapes, olives, Jasmine and roses. 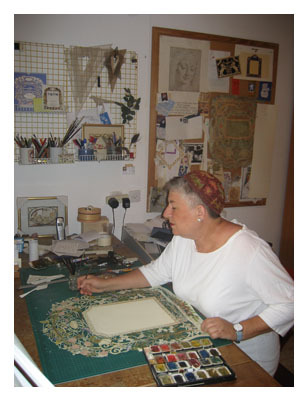 Fruma’s content is inspired by the rich base of the traditions of the Jewish people and their lifestyle over the generations, and her paper cuts bring to life many of the most important events in the Jewish life cycle. A blessing on the birth of a daughter, a special prayer for long life and the success of a newly-born son, bar and bat mitzvah greetings, the commemoration of an engagement, wedding ketuboth of different shapes, sizes and design, special mountings for landmark wedding anniversaries, Sabbath candle lighting prayers, Eshet Chayil and a multitude of other celebratory and commemorative prayers that have been embedded into her unique artistic talents and which occupy price of place in the homes of their owners in Israel and overseas. Fruma Kidron lives her work through the quotations from Jewish prayer that characterize her paper cuts. These are drawn from the Bible, the Midrash and the writings of the Sages. The graphic element of her texts is an integral part of her work. This is clearly seen from the way she styles her calligraphy into the specific features of each of her compositions. Fruma’s painting materials are water-based paints of unique diversity. 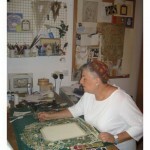 Her work has been exhibited at the Wolfson Museum at Heichal Shlomo in Jerusalem, the Feldman Jewish Museum of Art at Bar Ilan University. The Museum of Art at Kibbutz Hazorea and the Caeserea Cultural Center. Fruma Kidron is married and mother to four children and six grandchildren.